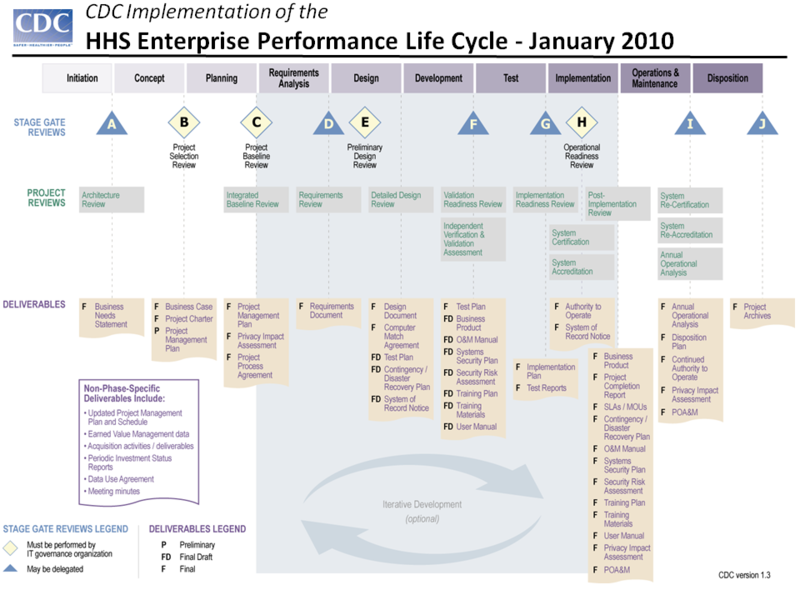 The Department of Health and Human Services (HHS) Enterprise Performance Life Cycle (EPLC) is a framework to enhance Information Technology (IT) governance through rigorous application of sound investment and project management principles and industry's best practices. The HHS EPLC provides the context for the HHS IT governance process and describes interdependencies between its project management, investment management, and capital planning components. The UP encompasses Federal regulatory requirements, the HHS Enterprise Performance Life Cycle (EPLC) framework, requirements of CDC's Information Resources (IR) Governance processes, Program Management, Project Management, Product Development, and other relevant internal and external standards, policies, and requirements. Hover your mouse over the different areas of the image map to learn more about the components that make up the CDC Unified Process.